A lot of people ask this question. What is a heat gun? How it is different than a soldering gun? Well, they both are totally different devices altogether. A heat gun is a hand-held device that can emit hot air of temperatures ranging between 100°C and 1000°C. Heat guns are similar to a handgun, however usually are elongated device with a trigger at the edge for releasing the hot air. There are compact and light weight heat guns are available as well. Where is a Heat Gun is Used? A heat gun is used in wide variety of applications such as general purpose heating applications, removing paints, in laboratories,loosening floor tiles,loosening rusted bolts and nuts, defrosting freezers and so on. Here is a video demonstrating the usage of heat gun for stripping the wall paint. What are Some of the Best Heat Gun Brands? Like soldering gun manufacturing companies, even in heat guns, some brands clearly stand out. Wagner, Black & Decker, Dewalt lead the show here. Now, let’s see what are the 5 top heat guns available right now? We have selected the below heat guns after examining various parameters such as temperature range, features, price and by comparing few other aspects. 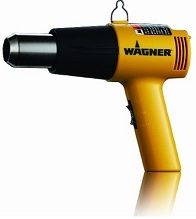 Wagner heat is gun is a general purpose heat gun emitting temperatures of 750 and 1000 Fahrenheit. This heat gun is great for jobs such as removing paints, loosening tiles, loosening bolts and nuts and many other heating applications. 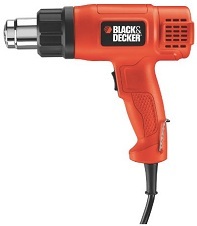 Here we have another top rated heat gun that offers dual temperatures (570 degree and 900 degree Celsius). 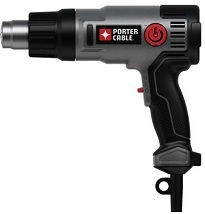 This heat gun is ideal for stripping paint , varnish and removing decals. Coming from family of a leading power tool company, this heat gun never fails to impress you with its sturdy design and excellent grip. Dual temperature settings allow the operator to switch between two temperatures according to the job he is undertaking. Being a lightweight tool, this heat gun works like a charm and well suited for variety of applications. 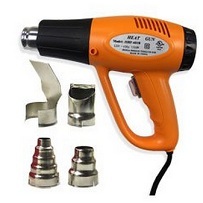 What we liked in this best rated heat gun is its ability to allow user to vary the temperature according to his need. 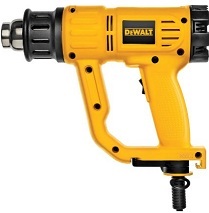 This heat gun boasts a powerful 1500 watts motor and is an excellent choice for works such as paint removals, bending plastic pipes, welding plastic pieces, removing adhesive tiles, shrinking plastic tubing etc. Last but not least, Dewalt heat gun delivers powerful performance and is a more economical choice considering its affordable pricing. Dewalt heat gun packs number of useful features such as variable temperature control, built-in overload protection, built-in storage and feels comfortable in your hand even after extended period of usage. Heat guns are extremely useful in wide variety of heating applications. We hope this article was useful to you for gaining a basic understanding on what is a heat gun , its purpose and what are some of the best rated heat guns out there in the market.